Upgrade your Original Super Vee 27 with the new Brushless 1800kv motor that comes in the SuperVee 27R. More top speed with less motor cogging to allow for better handling when decelerating. Pre-installed Male 4mm gold bullet connectors with included 4mm Female Bullets for your ESC. Double shielded, permanently lubricated dual ball bearings. 25mm motor hole spacing, motor fits 540 motor mounts. 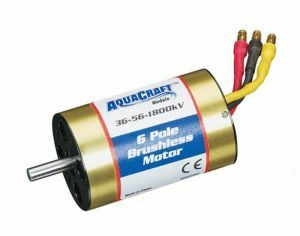 COMMENTS: This motor can be used as a direct replacement for the Original SuperVee that came with the Blue brushless motor.